If you would like a preview of what's covered in this class, click here to watch the introduction and first three lessons of this course (free of charge), or scroll down for more information. This course is for the novice user who has little or no experience with Microsoft Word. 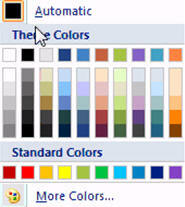 We will begin by learning about the parts of the Word interface, including the new Ribbon. We'll learn about all of the different components of Word, including the Quick Access Toolbar, Status Bar, Zoom controls, and so on. 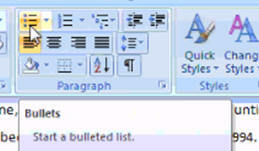 You will learn how to properly and efficiently type text in Word. We'll be writing a business letter in this class. You'll learn about word wrap, backspace, delete, spell-check-on-the-fly, indenting, and more. Next you will learn how to edit your document. We split large paragraphs up, and merge smaller ones. We'll learn about the non-printable characters (the paragraph and tab symbols, for example). You'll learn what a Hard Return is. We will next learn how to create a bulleted list, add words to our custom spell-check dictionary, and put a closing on our letter. You'll see how to add a TO and FROM address on your letter, insert line breaks, horizontal lines, and what the difference is between "ignore" and "ignore all" in the spell checker. We'll learn how to format text properly. You'll learn how to select text with your mouse, use the floating mini-toolbar, set bold and italics, text align right and center, and how to change fonts and font sizes. Of course, we'll learn about changing our text color too! Next we'll learn about one of the most useful features in Word called the clipboard. We'll learn how to cut, copy, and paste text. We'll also learn how to undo mistakes. You will learn how to save your documents to your computer's hard drive so you can load them up later. You'll also see how to save your document with a different filename, so you can make copies of them. Finally, you'll learn how to print your documents, set different printer options, perform a quick print, print preview, and send your documents via email. 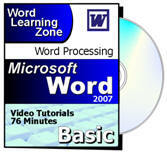 Again, this is the perfect class for anyone who is new to Microsoft Word 2007. If you have little or no experience with word processing, or you just want to get familiar with how Word 2007 works, this class is for you. You should have some basic knowledge of Windows beforehand, but we'll teach you everything you need to know to use Word to make simple documents. Of course, if you have any questions about whether or not this class is for you, please contact me. I always learn things; enjoyed 2007 Format. I thought content and speed appropriate. LOOK forward to level 2. Brian Gregory on 9/9/2009: I agree with all the previous comments. Evelyn McElwain on 6/4/2010: How do you delete a document from the saved list? Right-click on it and select "remove from list." Sylvia Burger on 9/25/2010: What a relief to find a clear explanation to Word2007- which I have hated prior to this lesson. Perhaps when I am done I will no longer be so frustrated with this version of Word.. Thank you. Bev on 1/2/2011: I just started on lesson 1 of Microsoft Word 2007. Is there anyway to make the screen larger? Our videos are displayed in a small window so that you can have them open side-by-side with the program that you're learning. For example, you should have Microsoft Word open while you're watching our videos so you can follow along with the examples in the lesson. However, if you want to watch the videos FULL SCREEN, then click on the checkbox at the top of our Video Player software that says, "EXTERNAL." This will then cause our videos to play in Windows Media Player. You can then resize, move, or maximize our videos to full screen if you'd like. Sorry, but if you're watching our videos online in the 599CD Theater, there is currently no way to resize the videos. You must use our Video Player software, or download the videos manually and play them in Windows Media Player. Joyceline Vedasto on 1/12/2011: how do I merge letters? If by "merge letters" you mean you want to perform a MAIL MERGE (taking the same letter and sending it to a bunch of people) then I haven't covered that for Word 2007 yet. I do cover it in my Word 201 course for Word 2003, but it's a little different. I'll be getting to Mail Merge for Word 2010 very soon - which is very similar. It looks fine for me. Is anyone else having this issue? Perhaps you just need to reload the lesson. Are you watching it online or did you download it? jay owen on 4/4/2011: how do you book mark a session so I can come back to that session later? I don't understand your question. What do you mean by "bookmark a session?" rafaqat on 6/14/2011: very nice way to learn word..
Amanda Kaminski on 11/3/2011: Can the user activate close captioning for this training product? Sorry, no. Closed captioning isn't available. JB on 1/6/2012: Sir:where you say I'll find the Office button in the upper Let corner, I only see the Firefox symbol and believe if I were using IE that I would see the symbol for it. I need to know how to make Word2007 stay on Times New Roman 12 font since that is what most publishers demand manuscripts be written in, Thank you. BTW - you have a very pleasant and clear voice. I am enjoying these lessons, but why are you showing me size 11 font when I've asked for size 12? That's one of my problems. After I set it to TNR 12, it slips bake to calibri 11 as soon as I move my cursor away from the setting part of the ribbon. I have the same question. I need to shut down now and would like to come back to this point easily as I had to dig through my Sent folder at Yahoo! to find your great lesson again. Thank you very much. I think that's what NOEMAIL means by "bookmark." tutorjb1 on 1/14/2012: Richard: You've talked about a Tab Key, but I can't find one on my Toshiba SatelliteL305 laptop. Why is that? I suppose I could just hit the Space bar like on a typewriter, but an editor told me that publishers preferred block paragraphs with no indentions so it doesn't matter. I'd still like to know where the Tab key is on this computer. I've read for years online and in _Consumer nReports_ magazine that Toshiba makes the best Windows computers. I can only use one hand to type and the ergonomics on this laptop are great. I wouldn't want to have to use a different keyboard. Every computer made in the last 20 to 30 years that I've seen has a TAB key. It's usually directly to the left of the "Q" key. thought to to fill out forms, but didn't know you could indent a specific number of spaces with it. BTW - You have a great sense of humor. Keeps me alert during the later parts of lessons when they really start to get tough. It was Jay Owen, not NOEMAIL asking about bookmarking your lessons on Word. I figured out how to "pause" them, but have forgotten what I did now. I think if you could explain how to pause them so people can take a break or do other things then come back and pick up where they left off that it would help a lot of your students. You can count on the highest rating and best comment I can think of when I finish listening to your Word lesson. I think I lost it the first time because I rated your answer before I'd finished because it was gone when I got back. Many experts' answers are short enough(too short) to fit on the one page so can be rated immediately, but yours are so wonderfully thorough, I don't want to risk asking the same thing just because I didn't read far enough the first time. maribeth on 8/29/2012: I watched this in youtube yesterday and its really informative lesson. I might go on level 2 because I really want to know more on this. You should be able to order it now. We were offline since yesterday at about 4pm. Doris on 9/3/2012: will Basic 1 in word 2010 be out SOON? No. I will probably NOT be upgrading my Word 2007 Basic classes to Word 2010 because they would be almost IDENTICAL which would be a waste of time for ME to record and for YOU to watch. I will likely be making some EXPERT-level Word courses which will pick up where Word Basic 5 left off. I will also be releasing Word 2013 Beginner classes when that is officially released. Anonymous on 1/30/2013: very nice teaching! I have opened my Windows 7 and see that the status bar isn't noted on the bottom of the screen. Is there a way in which I can open this? Hi Pamela. I hope to have some new Word 2013 classes out VERY soon. I'm probably going to re-record Beginner 1-5 because there are some differences from 2007 to 2013. Then I've got about 5 Expert classes planned. As far as printers go, I've always liked HP for inkjet and Lexmark for laser. If you want super-high-quality business prints, go for color laser. If you want inexpensive, lower-volume printing, go for inkjet. If you plan on printing PHOTOS, get a photo-quality inkjet. I couldn't tell you which is the best printer on the market now. Check the review sites. When I'm in the market, I just do a little research to see what the current best [insert device here] is. your mail merge word course available? Word 201 is an old course but covers it. There is a Change Case button in the Ribbon now you can use to swap the characters. You can look through the full Course List here. Theresa Wilkerson on 9/13/2016: I was definitely learning from the class and so excited to move forward. Lesson 4 won't let me see it because of wrong password and its not. Are you trying to watch this offline?